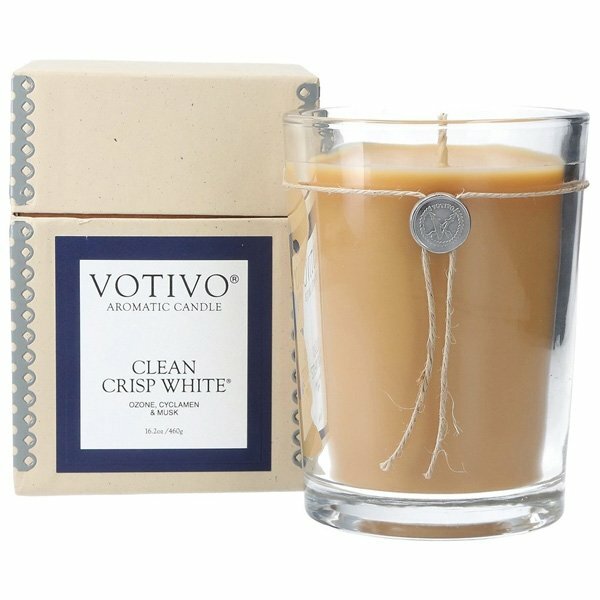 Votivo Large Clean Crisp White Candle is an indescribably complex scent, yet simple by nature. Invokes memories of sun dried white sheets billowing in the crisp springtime morning, uncontrollable giggles as freshly bathed little bodies run through the house, and an overwhelming aroma of nothing but CLEAN. Fruity Citrus. Ozone. Cyclamen. Ylang. Lilies. Sandalwood & Musk. Supersize your Votivo Aromatic Candle experience with the 16.2 oz Large Candle. Enjoy your favorite fragrance even longer with a burn time of up to 100-110 hours.